uBar for Mac is the Dock replacement. If you've never really liked the Dock, or have a soft-spot for the Windows Taskbar, uBar is here to save the day. 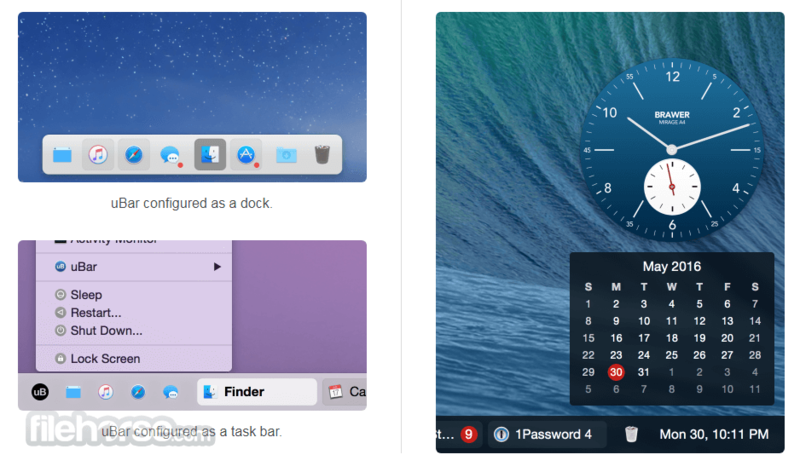 uBar can be configured as a dock or task bar for OS X. Find the window you're looking for at a glance. If an application has more than one window, you'll know right away. Click that application to open the window menu, which allows you to bring any window or even just the application itself to focus. You can turn window grouping off, and all your individual windows will be shown right in uBar. You can even enable windows previews so that when you hover the pointer above an app you can preview of all it's windows. You can drag the edge of uBar for Mac to expand it up to 5 rows. Applications have easy-to-read badges, and you can tell if they are hidden by seeing whether their name is greyed-out. uBar has a Favorites area for your most-used applications, and built-in Desktop and Trash favorites. Control/right-click an application to show an alternate menu from which you can quickly quit it. When an application is unresponsive, you can tell immediately from the hatched red background. Hold the Control key, and you are in Activity Mode, with CPU and Memory usage displayed for each app. Hold the Shift key, and you can quit any app or close any window in one click. Requires OS X 10.9+. macOS 10.12 Sierra Ready. Download Now! If you have multiple monitors, uBar displays on the screen of your choice. Pin or unpin uBar to any corner of the screen. Note: 28 days trial version. Requires 64-bit processor.